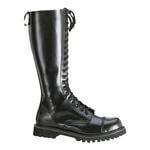 Q: I was looking at your Rocky-20 eyelet knee high boots and saw you only have 4, 8 and 12 sizes. I wear size 11. Will you be getting any more in in my size? We are actually expecting them in any day now. If you would like us to email you when they come in go to the Notifications tab on the product description, select your size and enter your email address. As soon as they come back we will email you to let you know they are back in stock. But, we expect to have them in tomorrow 2/22/17. Answered by Blue on Tuesday 21 February, 2017.